Materials used within the marine industry are often exposed to corrosion and unwanted contaminants. At ProStrip Sandblasting, we understand that the material surfaces of marine equipment and parts require special care to get it back to its original condition. That is why we have invested in premier marine blasting equipment and abrasive media to ensure effective, efficient and long-lasting treatment of your marine surface. Traditional blasting of marine surfaces often leaves the vessel or equipment prone to corrosion. For this reason, it is important to trust a company that has an extensive understanding of not only the blasting equipment and media used, but also the boat and marine equipment, parts and materials that require restoration or surface preparation. 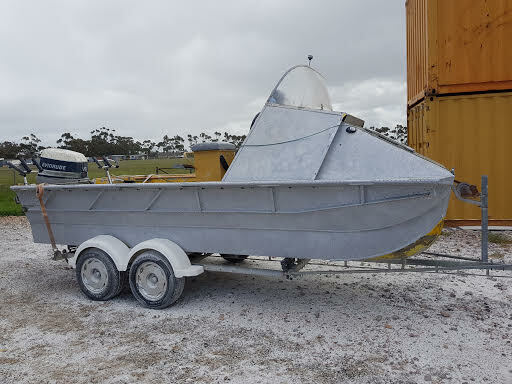 ProStrip Sandblasting in Melbourne has a professional team of experts in industrial marine blasting. The blasting techniques and applications we use have been proven to tackle any marine surface, including fibreglass hulls, sensitive marine equipment, heavy marine parts and many more. Soda Blasting is a common abrasive blasting technology used when it comes to restoring marine surfaces back to its original condition. The abrasive technique is a mild process that uses larger crystal sizes of sodium bicarbonate granules (baking soda) to blast surfaces. Here, marine blasters work in conjunction with an air compressor to propel the media to effectively remove contaminants without damaging the marine surface underneath the paint or protective layer. What makes this blasting technique the mildest form of abrasive blasting is that it shatters on impact. The blasting technique is also chemical free and environment-friendly. This makes it the perfect restoration process for soft materials such as aluminium. Remove or neutralize light rust on boats and marine parts. Strip the paint, body filler and undercoating of marine surfaces. Remove corrosion from marine equipment, parts and materials. Clean boats, large marine vessels and marine equipment. We know how important it is to protect and retain the quality of your marine surfaces to avoid corrosion and contaminants. At ProStrip Sandblasting, we pride ourselves in providing clients premier workmanship above industry standard. In achieving this, we invest in only the best, high-performance blasting equipment and abrasive media that the industry has to offer. Our qualified specialists in Melbourne also possess years of experience in performing effective, efficient, safe and environmentally friendly industrial marine blasting services. We offer one of the widest ranges of techniques for marine blasting in the Melbourne region. With over 10-years experience in servicing the marine industry, our blasters are qualified experts in their field and can provide you with the best action plan for surface preparation and restoration. Our services are cost-efficient – get in touch with us for a free quote. We use high-quality blasting grit, powerful equipment to ensure effective and long-lasting surface finishes. Our solutions and techniques are engineered to meet your specific requirements. We only use eco-friendly grit that complies with the OHS. Get an Obligation-Free Quote for your sandblasting needs by simply filling out our Contact Form. ProStrip are Melbourne’s leading commercial & industrial blasting solution’s provider. Call today and speak to one of our experts about your requirements.